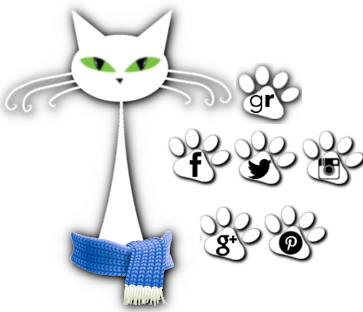 So what's your nekkid-kitteh stance? Aws or ews? I've never seen one but am real curious what they feel like! And do they get wrinklier as they get older?? Oh your poor boy! I'm pretty cautious around those birdies too so I feel his pain! The first kitty looks like a little demon. I so want one. 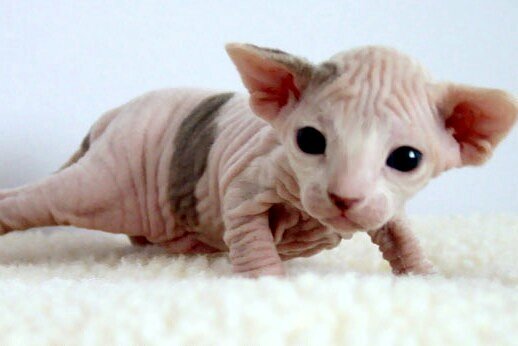 If I had the $ and didn't already have 5 pets I'd buy one of those little wrinkly babies. LOL I love that little demon kitten. I just want to squish his cheeks! They are so cute! I've only ever seen one nekkid kitteh and he felt just as soft as the ones with fur. I like my kitties with fur on them. LOL. LOL Me too Sue! I think it would be kinda funny to see what my herd looked like nekkid though! I don't think I'd ever stop laughing. Oh yeah. From what I've heard/read they definitely are! 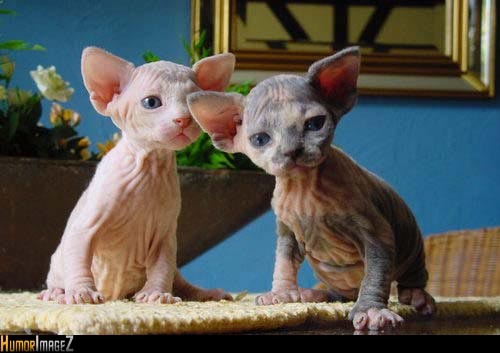 I'm not sure how I feel about nekkid kittehs! Some seem cute, some seem strange. I do wonder how they feel, though. Stopping by from Cat Thursday! There is beauty in their strangeness, and they are so expressive!Thanks for sharing! Indeed there is. I love how you put it Reiko! You have to admit...they are cute! 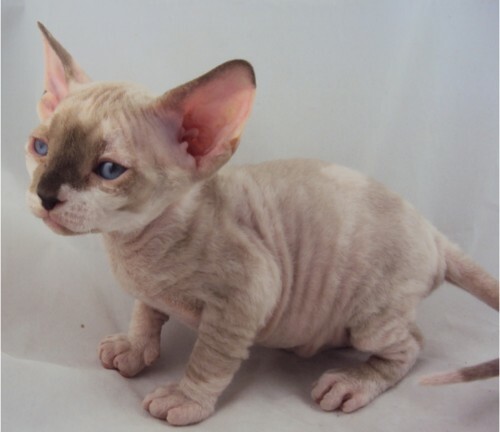 I think they're cute, but honestly I've never seen a cat I didn't think was at least a little cute. I think I prefer mine with fur. 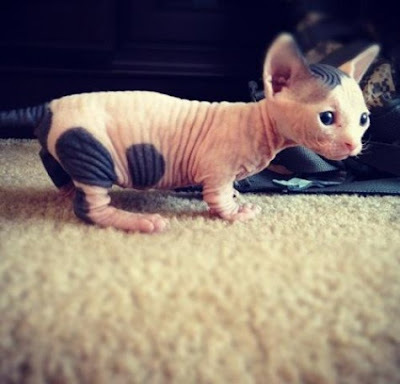 Like you, I'd be willing to rescue a naked kitty if s/he needed a home. I wonder if they're adopted quickly, though, since people might find them unique? I've never seen a plea for help for a naked kitty from any of the rescue groups I keep up with... I also wonder how they do with furry ("dressed") cats? It seems like ours smack the daylights out of each other when they play. I can't help wondering how that would work for a kitty without the fur padding? 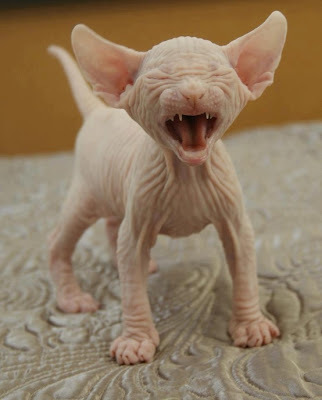 Now you have me wanting to research bald cats! I do love the pictures, especially the one with its head cocked to the side. LOL well if you find the answers to your questions Danielle PLEASE let me know! I hadn't even thought how they'd do with "dressed" kitties. Huh! 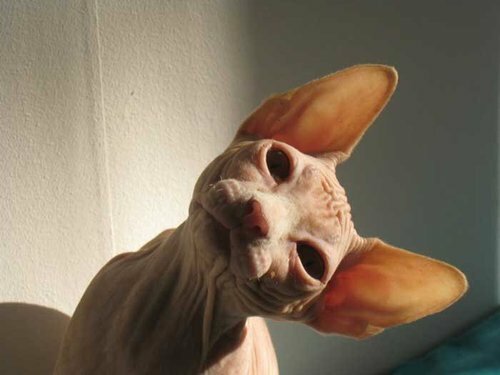 I own a rescue and we've been contacted I think twice over the last 9 years about nekkid kitties. Both were seniors and their owners wanted to give them up :( I think they'd probably be in high demand but you'd really have to screen adoptees since they are so high maintenance, ya know? I loved that little one with the cocked head too! Such an interesting baby! I wouldn't go looking for one but if it came into my life I would love it. I've heard they need frequent baths because they smell. I'm not one to go buy a breed. I prefer to adopt. I prefer adopting too but we've actually been contacted over the years about taking them in. Didn't realize the smell bit but I've heard about baths and having to clean ears more often too. I think I'm way too lazy for them. LOL. 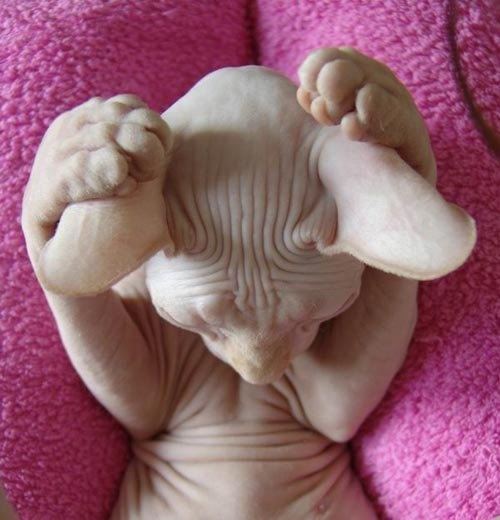 Lovin' the nekkid-ness of it all! I think they're kind of cute, although I think they look like claymation figures sometimes. 5th pic down...seriously, it looks like it's made out of Play-Doh or clay. LOL! LOL oh he so does! I secretly think they're kinda cute too ;) Thanks for coming by Michelle!